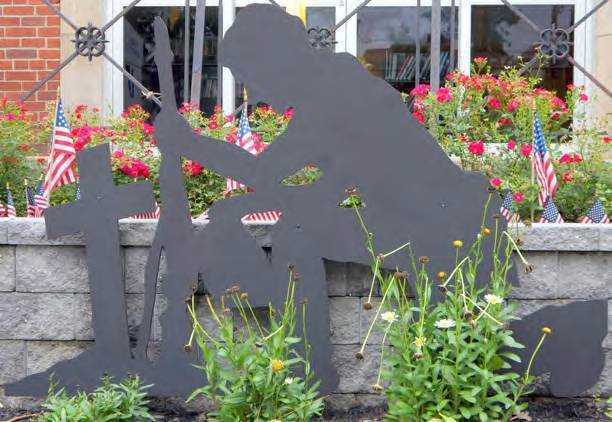 ROSELLE PARK, N.J. — A New Jersey borough has agreed not to restore what was deemed a religious veterans display to the lawn of the public library in order to settle a lawsuit filed by a nationally-recognized humanist organization. “This lawsuit was about ensuring that the government must refrain from … religious favoritism, and we’re glad that in the end the Constitution prevailed,” David Niose, the director of the American Humanist Association’s (AHA) Appignani Legal Center, asserted in a statement announcing the settlement on Thursday. As previously reported, AHA sent a letter last summer to Mayor Carl Hokanson to demand that a silhouette of a soldier kneeling before a cross grave marker be removed. Hokanson had purchased the cutout with his personal money and donated it to the public library as a memorial to fallen soldiers. AHA threatened litigation if its demands for removal were not met. It advised that the organization had received a complaint from local resident Gregory Storey about the silhouette, as he was unhappy that borough officials had not heeded his concerns. According to NJ Advance Media, Storey is married to council member Charlene Storey, who resigned for a time in December 2015 to show her opposition to another religious matter. Hokanson disagreed. He opined to the Union News that it is rather a mission of the Storeys to eliminate Christian symbols from public life. In September, AHA followed through with its threat, suing Roselle Park leadership in an effort to obtain a permanent injunction against the display, as well as nominal damages for the borough’s alleged violation of the “separation of Church and State” and the Establishment Clause of the U.S. Constitution. Shortly thereafter, council members voted 5-0 to remove the silhouette. This month, in order to settle the lawsuit, it was agreed not to restore the memorial or erect any similar displays in the future. Roselle Park officials have not commented on the settlement.